The mathematician A. F. Moebius (1790-1886) discovered this one-sided surface that became known as the Moebius Strip or Moebius Band. 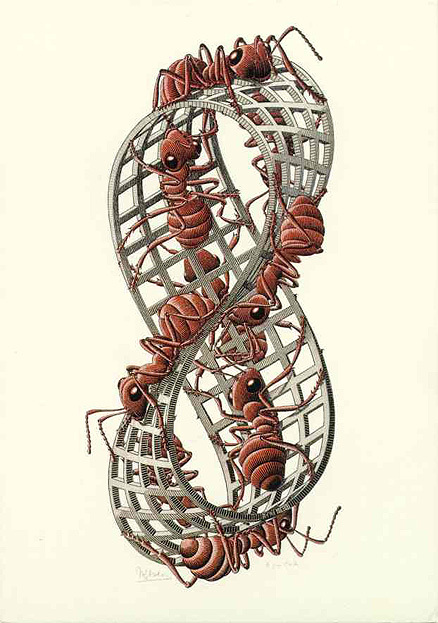 The artists M. C. Escher (1898-1972) was intrigued by the strip's puzzling geometry and included a procession of ants crawling along a Moebius Band in his collection of drawings depicting spatial illusions. 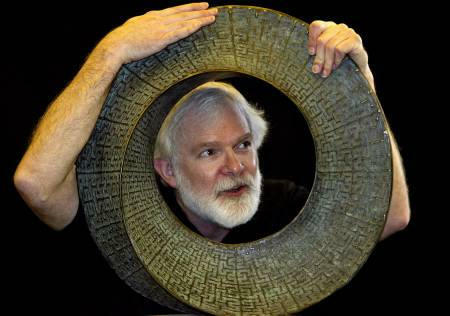 The Moebius Strip, however, is not an illusion. It can be modeled in 3D and its topological features can be explored using an interactive computer model. Inspired by Escher's work, Bert Schoenwaelder created this unique VRML application with an animated procession of balls during his internship at the University of Michigan Virtual Reality Laboratory. A simple endless band in the form of belt-shaped loop (below left) has two distinct surfaces and two edges. Moving from one surface to the opposite site requires crossing one of the edges. The Moebius Strip is an endless band that includes a half twist (below right). Amazingly, the band has only one surface and only one edge. Moving along the surface (like Escher's ants) will bring you to the opposite site without crossing the edge. You may notice the small size of this VRML file. The geometry of the latticed band is not explicitly contained in the file but generated by an intelligent script. Every time the file is opened, the script creates the geometry during initialization (which may take a little time on a slow computer). A Moebius Strip made from Pop Cans (in VRML) by "Drastic-Creations"